“My baby had a surgery when she was just 2-months-old. She was in ICU for a month, and just before the day of her discharge, she became jaundiced. My family gave up on her, even my husband was a bit reluctant to save her. My relatives told not to spend for a girl child and to leave her in the hands of fate. I have been struggling all alone to save her life. I will not give up until my last breath.“ - Kavitha, mother of Divya Shree. Divya Shree was born perfectly well, Kavitha noticed that she did not gain weight at all for a long time. 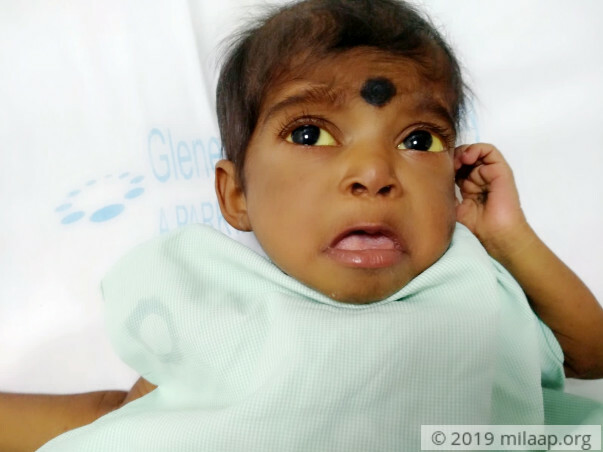 When she turned 2-months-old her skin and eyes turned completely yellow. Her stools became white in color. Reports confirmed that she has liver disease. She had an emergency Kasai surgery. Unfortunately, it did not help her. Divya is now 9-months-old, she weighs only 5 kilos. She has unbearable stomach pain. She hardly sleeps. Swelling in her stomach has not reduced. A month ago, jaundice became severe. She refused to eat anything, suddenly she became unconscious. She was admitted to ICU. “I came all alone to the hospital, no one was willing to help me. My husband went for work. Everyone thinks I’m fighting a losing battle but I know my daughter will fight through it. My own family is not supporting me. A surgery can save her life. I don’t know whom to turn to help. All I can do is to donate a part of my liver to her".- Kavitha. Divya is in ICU for more than a week. High dosage of medicines and blood transfusions are given to her. She is in excruciating pain. Only a liver transplant can save her life. 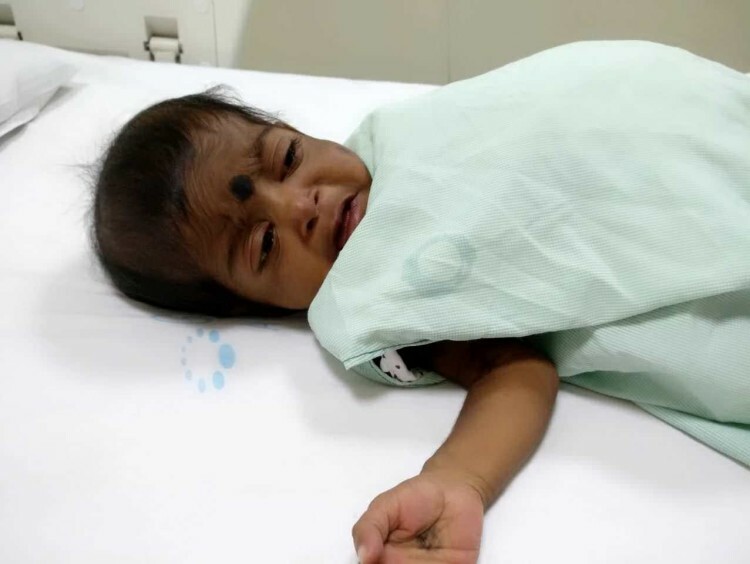 She has been in pain since birth, she has experienced only painful injections and medicines. 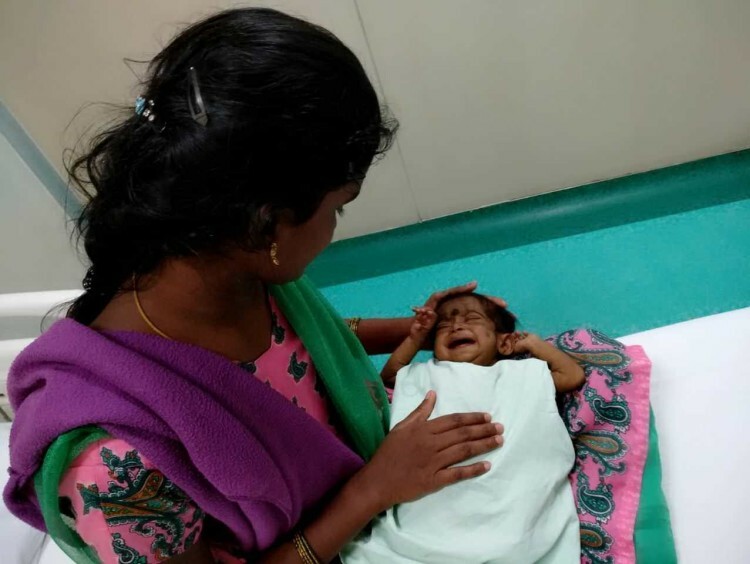 Kavitha cannot bear to see her little one going through so much of pain. Divya's father Suresh Babu works as a mechanic. His family has stopped talking to him because he supports his daughter and wife. After seeing the struggle and pain his baby and wife going through, he started working day and night to make money. Yet, he is running short of funds. Even if he works the whole year he will not be able to arrange the money required for the transplant. Divya's parents are desperate to save their daughter from this dreadful disease. They wish to give her a normal life. They do not have anyone to support. Little Divya cannot survive without a liver transplant. They have very little time on their hands. 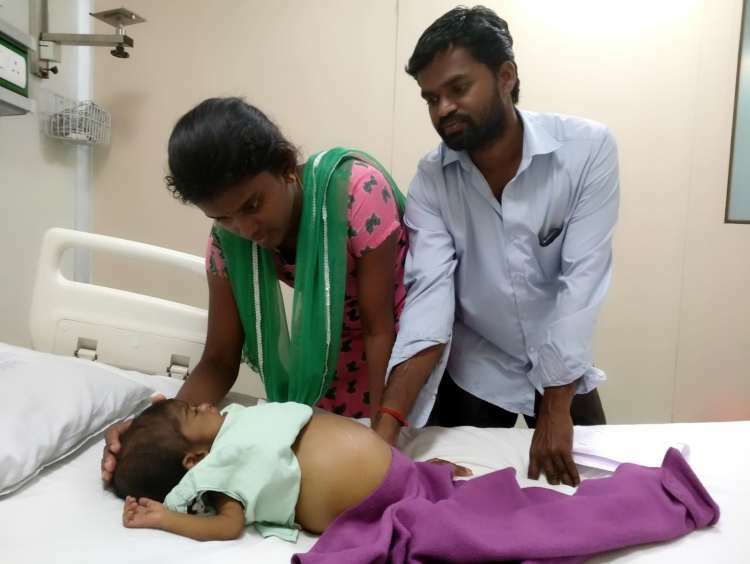 Her mother is donating a part of her liver but they cannot afford the treatment. 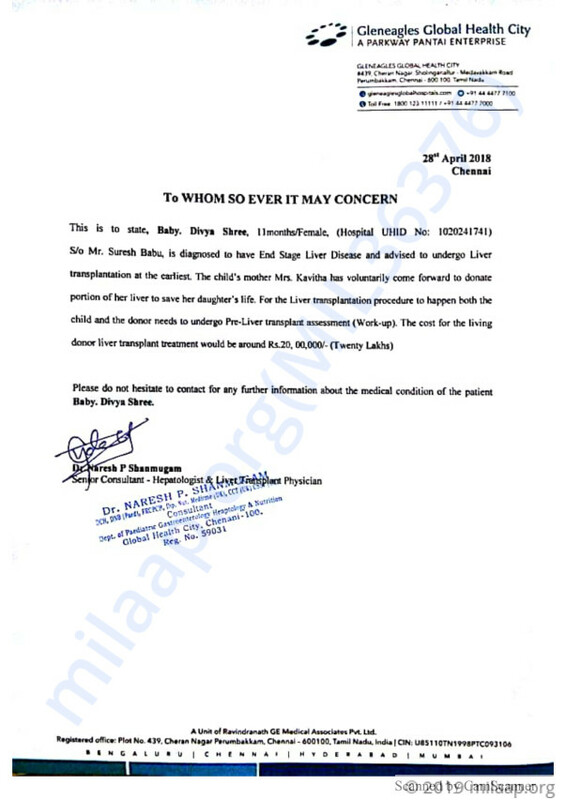 They require Rs 20 lakhs for the transplant. Only your support can save her life. Thank you for the wonderful support that you have shown towards Divyashree. I have some news to share with you today. 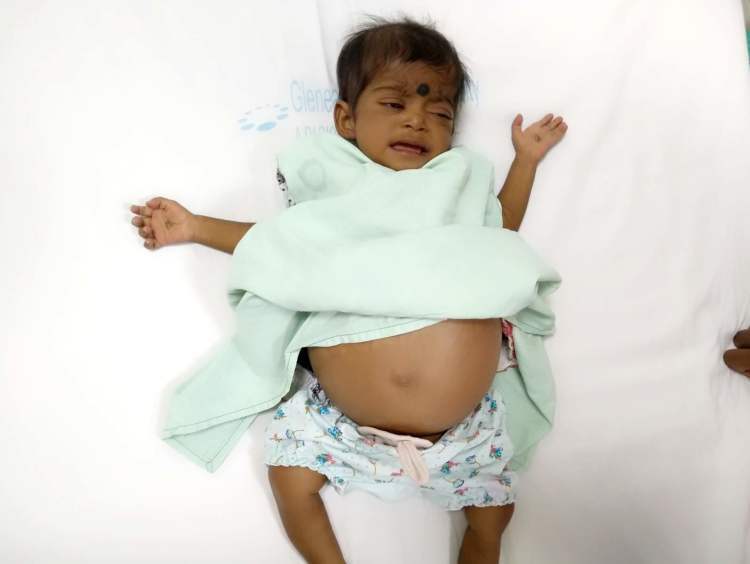 Divyashree was diagnosed with a liver ailment and was undergoing treatment for the same. She was very frail when the pre-transplant test were conducted. Her little body was unable to take the stress and she passed away on 3rd May. All the funds raised via this campaign have been used to clear her medical expenses.